Nothing could have prepared me for spending a weekend with the Hertz Ford Mustang after spending 72 hours with the Tesla Model S only one week earlier. Perhaps it’s parallel to stepping out of a steaming Japanese Onsen into the icy Fuji river. This story is as much about contrast as it is about the obscene adjectives that describe the 5.0L 303kW Mustang GT. Reflecting on my Tesla experience, it was like a new tailored suit. From the moment I took my seat, the Model S would customise itself to fit me in every way. It made me feel like one lucky guy and quickly became part of me. Jumping on the Hertz Mustang was the rodeo that ruined the suit. Or perhaps, it was more like wakeboarding down a river in a tuxedo? I was a RideHacker long before Ride Hacks gave you something to read on a Sunday morning. It was father’s day and I had no present on hand. What could a son bring that would make his father smile? A Hertz Renault Mégane R.S. Cup for a weekend. I didn’t pay more than $200 for that experience, but it was the most fun we ever had driving a car. Sensibly of course. Well, Hertz have done it again. The Ford Mustang GT is the latest addition to the Hertz Adrenaline Collection. 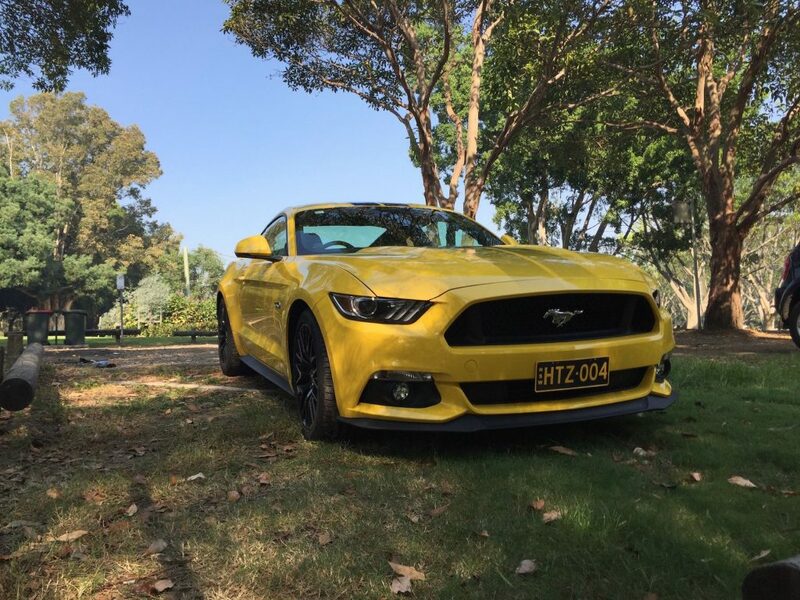 With Ford announcing the Mustang’s maiden voyage to Australia in 2015, Hertz further announced that they would be delivering 10 Mustangs to Sydney and Melbourne airport and city locations. The Mustang isn’t foreign to Hertz in the US. A friend of mine opted to rent the 2.3L ‘Eco-Boost’ Mustang in Hawaii. Despite enjoying the very American experience (on a Pacific Island…), he assured me with the greatest confidence that the time spent in the 5.0L V8 Hertz Mustang was chalk and cheese to the four-cylinder. I’ve written and Youtubed (it’s a verb, trust me) many times, I strongly dislike renting from Airports. As they run long shifts, they’re typically staffed for the 90% of time when there is a trickle of travelers wandering in, not the 10% of times where surges of 20 people line up demanding immediate service. Hertz is not my favourite airport location to access and exit from. If you happen to leave the same time as five other cars, you’ll be lining up at the gate while the inspector deals with any additional damage concerns of each renter. It’s not a system built for volume. Given my recent obsession with renting cars for your reading pleasure, I’ve learnt that the ideal time to rent any car from the airport is after 9pm at night. You generally have very few people around, enough staff to provide personalised service, and you have the benefit of driving out and returning the car outside of peak hour traffic. On this occasion, the Hertz customer service attendant was delightful. It was one of the best experiences I’ve ever had from a rental company. He showed genuine interest in why we chose the Mustang and let us choose between the black or yellow models sitting in the parking lot. I delegated the decision to my wife. She was feeling adventurous, we went with yellow. The interior is retro/cheesy/…whhatttever, who cares? The bucket-style seats welcome you to the driving seat. Whilst you’ll never mistake that you’re sitting in the prancing Italian horse, the feeling of leather squeezing your shoulders inspires confidence. But you won’t need much confidence to drive this car. Despite the looks and the noise, and after pushing the button and hearing the engine roar, it’s a reasonably calm car to drive when you don’t fiddle with any buttons or switches. Given that no one wants to drive a Mustang like a responsible citizen, you’ll need to push the gear lever to Sports and flick the two retro-styled switches into Sport, Sport+ or Race, and the steering to ‘Sport’. Now it’s a bit more fun. One annoying observation of this setup is that the system would reset to ‘Comfort’ settings (read: no power and light steering) every time you switch the car off and back on again. It’s a Mustang dammit! Make no mistake, this is a fun car to drive. I would dare say that it is much more fun than the Tesla Model S. For me, that’s what makes it the perfect rental car. The following comments are assuming you are in ‘Sports+’ mode with ‘sport’ selected on the 6-speed automatic transmission. Wheel-spin will happen. Don’t use ‘race’ mode on public roads, you’ll have some damage to pay for and my ultimate guide to rental insurance won’t help you. Add a little moisture to the road and you’ll have incredible fun with little slips and slops around each corner. You don’t need to — and given the flexible suspension, I strongly advise you don’t — go fast. The suspension is relatively soft for a heavy car. It feels like a muscle car, not a supercar. Although perhaps this is a function apathy, not intentional design. We’ll never know. Where the Tesla Model S has incredible front-wheel grip and acceleration, the Mustang will both oversteer and understeer during the same corner, lose traction and gain it again, and then play catch up for the next corner. Precision is not a habit the Mustang has perfected. And whilst you could drive the Mustang over longer distances, I would imagine that you will either love it or hate it at the end of your trip. Personally, it’s a fun car for a few days but anything longer I would opt for the Europcar Mercedes C-Class. Oh and don’t plan on putting anyone whose legs can touch the ground in the rear seats. There’s no room if you want to be spacious in the front. When the Mustang arrived on our shores, there was no doubt it had its bullies lining up in the playground. It was the new kid to a school where the culture of Muscle Cars was a dichotomy, and teams were picked. The Holden Commodore crowd and the Ford Falcon crowd. There were also the older teachers who remembered the ‘good old days’ where the Mustang’s older father would rule the playground — they had no interest in making it easy for this protégé. Indeed, the Mustang wasn’t welcome to play by everyone. Yet since it’s first announcement, and continuing with hastening pace as I write this post, the local backlog of more than 6000 orders is continuing to push deliveries out to 2017. The connected, underground cult of the playground are underwriting the success of the new kid on the block. Barracking for him to win. Hertz placed their bets. What would you do with a Hertz Ford Mustang? That’s what we did. ‘When in Rome’ sounds a lot more romantic than embracing Americana, yet when you rent this American icon be prepared to do something new if you want to make it an experience. Where Tesla Motors designed a beautiful car around an incredibly connected network of technology. Ford added a computer to the Mustang so that you stay alive with an insurance policy intact after your afternoon of powerslides. This is why spending $230 for a day hiring the Hertz Ford Mustang is worth every dollar. Whilst there are few people who really should own this car, every motoring enthusiast should take it for a drive. If Hertz offered a Tesla for rental, it would be a bit of a waste. The Model S is too good to be explored in a single day. Indeed, as technology advancement pushes the imperative for the transition to sustainable transport, rental companies play a vital role in preserving and sharing driving culture from our past. Ride Hacks is here to show you where to look. 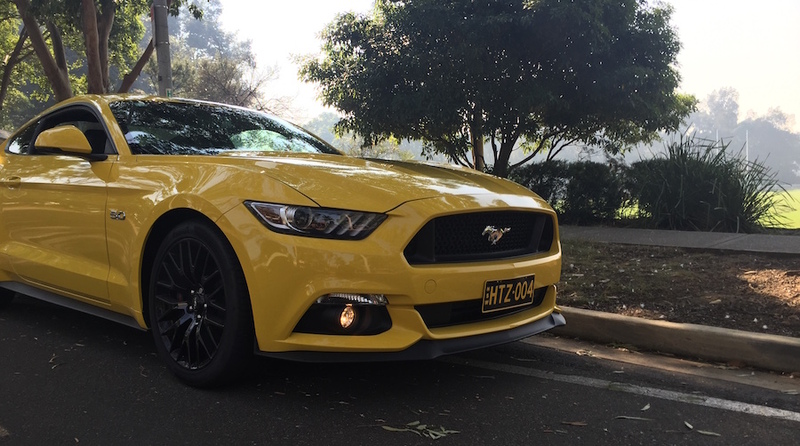 Fancy driving the Hertz Ford Mustang GT?